No time to waste, we need to jump right into this one. 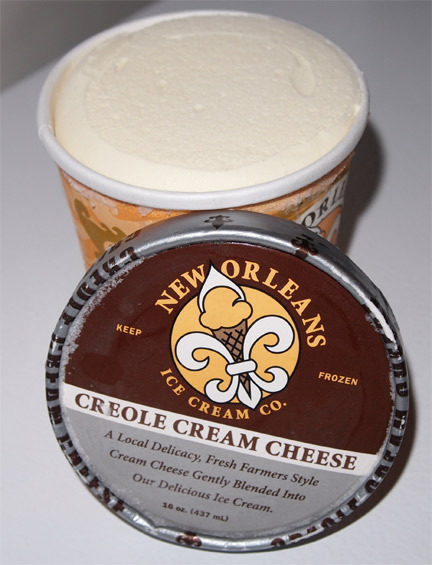 This is New Orleans Ice Cream Company's Creole Cream Cheese ice cream though I have no idea what Creole means... ok, do I ever know these things mean? Wiki says it's a mild and slightly sweet cream cheese. The container says it's "a local delicacy, fresh farmers style cream cheese gently blended into our delicious ice cream". Hmmm, no mixins? Interesting. I can admit it, I totally planned to take three scoops of this one and then pawn the rest off on my wife. Like so many other cheesecake flavors, I expected to be buried by an avalanche of cheeziness.... but then something wonderful happened, or should I say, I tasted something wonderful. 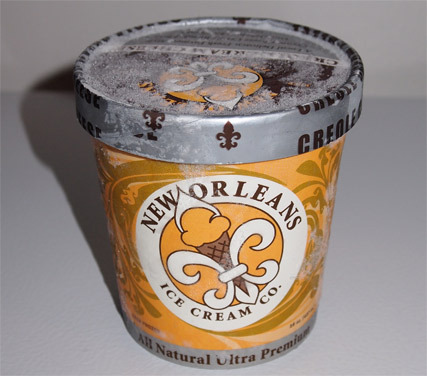 What New Orleans Ice Cream company has delivered is the most mellow cream cheese flavor ever. It's kind of sweet and rich like Graeter's Vanilla, but there is this lovely undercurrent of cream cheese flavor in every bite. It's so simple, it's brilliant. Let me put it another way by using cheesecake (not cream cheese) as my example. There are two kinds of cheesecake. There is a straight cheesecake that tastes of, well, cheese. Then there are the wonderfully made variety cheesecakes where the cheese is the binding agent that ties everything together without stealing the spotlight. They've turned that kind of cheesy magic into an ice cream flavor. I'm floored by how much I like this one. They've really done an excellent job of balancing the cream cheese with the ice cream. I thinking that as soon as my wife puts a spoon into this one, it'll be gone. Am I miffed at no swirl? Nope. Am I miffed at no mix-ins? Nope. You see, the one catch to this exquisite creation is that each serving is a whopping 70% of your saturated fat for the day. Apparently the cream cheese adds a ton of fat.... and oh so much flavor. This pint really is delightful. I want to think of something catchy to serve it with, but the truth is you should just savor it... very slowly... with a tiny spoon... and with your significant other. Share this one and treasure it. On Second Scoop: My wife had a small serving of this one and agrees it good. She said it reminds her of butter. Hmmm, you know, as I dug back in I too detect a buttery note, though I hate to call it butter. To me that has a negative connotation. This flavor is way better than that. I can;t tell you how much I want to just tear through and eat this whole pint in one sitting, but that would be so wrong. Instead, I will continue on with my tiny bites and half servings. This one is so nice that is all you need. It's like a decadent version of Graeters's most excellent vanilla ice cream. Awesome job on this one. Buy Again? If I could, I would! I'm really curious about the texture of this one. The serving is 85g so halfway between the lighter/fluffier frozen dairy desserts that are ~65g serving sizes, and the low overrun ultra-premium B&J/HD. Not to mention the flavor sounds awesome. Sorry, I do get a little vague when we are in the middle ground here. It's not gummy or light, but it's not super dense or super creamy either. It's just really well made, higher end texture. Oh it wasn't meant to be a criticism, I just meant I would like to try it because I don't see this mid level overrun. 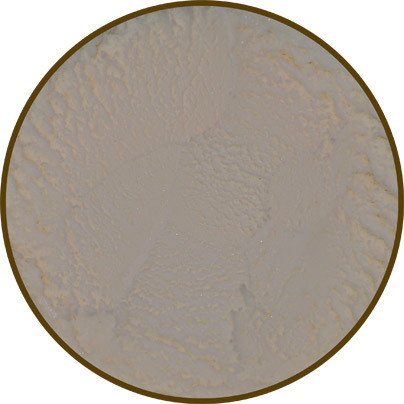 Turtle Mountain's coconut milk is around 85g but they use a few gums, etc. hehehe, no no, didnt take it as criticism, i was merely criticizing myself because I have a bit of trouble sometimes. When I saw ultrapremium, I have expected like 100+ grams per serving, but not so. They've still kind of kept a nice midstream weight to it all. Brown's Dairy also makes an excellent creole cream cheese ice cream. Btw, creole cream cheese is a soft, almost runny type of cheese. Not as sweet as regular cream cheese, and is locally used as a breakfast treat on toast or with crackers. I love cold cream cheese on ritz crackers! Bought the Mississippi Debris and loved it but it was plain chocolate ice cream the first half of the container. Then the second half was delicious. full of chocolate chips coconut and almond flavor. Too bad it can’t be mixed better.